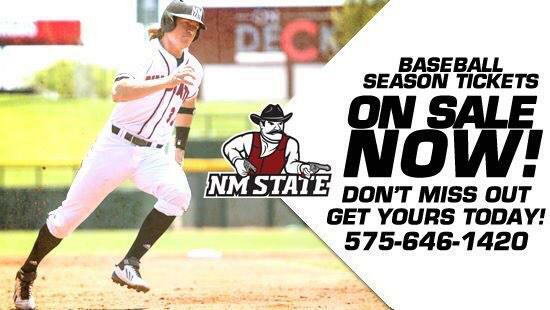 It was a mixture of veterans and newcomers that led the way for NM State. Preseason All-WAC members Bradley Nash and Taylor Livoti each finished the match with a double-double. Nash led the way with 10 kills and 13 digs, both team highs for the Aggies. Livoti, meanwhile, finished with a team-high 16 assists and added 10 digs. Freshman outside hitter Jordan Abalos almost made it three Aggies with a double-double, missing the feat by one kill. She finished with nine kills and 12 digs during her first match with NM State. Fellow freshman Ashlyn Brown added 13 assists to finish right behind Livoti in the category. The two teams would feel each other out during the first set as it went back and forth. The set saw a total of 14 ties, including late ties at 20, 21, 22, 24, 25 and 26. NM State would get the final answer, however, taking the last two points after the final tie at 26. Set two would start off the same as the teams fought back and forth early. But a five-point rally would open up a 12-6 lead for the Aggies and give the team the confidence it needed to go forward. Four-straight points by NM State late in the set stretched the lead to 23-14 and the Aggies would go on to close out the set from that point. As in the second set, the early portion of the third was tight, but an Aggie rally in the middle of the set once again gave NM State control of the set, and this time the match, as the Aggies would win the set in easy fashion and proceed to win the match. NM State will now close out its stay in Utah with two matches on Saturday. The Aggies will meet Montana State at noon (MT) before hooking up with host Utah at 7 p.m. Fans can follow both matches with live stats at www.nmstatesports.com. The final match versus Utah will also be streamed live on the Internet via a webcast on the Pac-12 website. Click here for access.